Elon Musk hasn't been in Detroit for two years and Tesla barely had a presence at the show. So Musk did the next best thing: he flew in to tell other automakers they've been slacking off and claimed Tesla will sell "a few million cars" by 2025. "All transport, with the ironic exception of rockets, will go fully electric," Musk said at the Automotive News World Congress. "The question is when it goes fully electric." Musk went on to say that the need for sustainable transport is incredibly high and that other automakers "need to put a huge amount of effort behind their electric vehicle platforms." "I strongly recommend making stronger investments in sustainable cars," says Musk. This is hardly unusual for Musk. He's not only been pushing other automakers to develop more eco-friendly cars, but he also has a habit of calling out other automaker's failings and bad ideas, including referring to hydrogen programs as "fool cells". That tradition continued in Detroit when Musk blasted the "golf cart" EVs of the past and that automakers aren't doing enough to break the misconceptions of electrics. When asked about the hybrid and electric vehicles that debuted this week in Detroit, Musk said it was hard to take them seriously until "we see a lot more serious numbers." "[Automakers] are uncertain about the demand for electric cars," says Musk. "It's sort of a chicken and egg problem." Musk went on to say that he thinks Tesla will be profitable by 2020, with help from the sales of the Model 3, and believes it's still on track to sell 500,000 vehicles that same year and expects to sell "a few million cars" by 2025. Per usual, that's ambitious. Maybe too ambitious, particularly for an automaker that originally promised the Model X would be on sale by now, but has since been delayed until the fall – although Musk said today that it will finally land this summer. But Musk seems to be gaining some perspective. He's a perfectionist and Musk admitted that he needs to slow his roll. 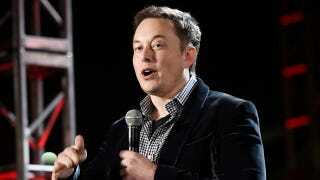 "I have a problem with punctuality," says Musk. "I'm trying to recalibrate a bit." What Will Tesla And Elon Musk Over Promise Next?